Recover critical system components using IDrive in case of a system crash. Locate and restore the System State Backup folder 'IDSystemStateData' from your IDrive account, to your local computer. Click 'Restore', under System State section. Browse and choose the downloaded 'IDSystemStateData' folder (restored earlier from your IDrive account). Click the 'Restore' button, to start restoring. Once the System State restore is complete, you are prompted to restart your computer. Download the System State Backup file with .bkf extension from your account using IDrive application. Click Start > Programs > Accessories > System Tools > Backup > Advanced Mode. Click the 'Restore and Manage Media' tab to select the .bkf file and the data that you wish to restore. You can also choose the location to which you want to restore from among the options provided: Original location/Alternate location/Single folder. Click 'Start Restore' to initiate the restore operation. If you specify the location to be 'Original location', the System state restore operation overwrites the current System State. To avoid this, specify the location as 'Alternate location'. Click the 'Report' button to view the log file. Once you close the 'Report' screen, you are prompted to restart your system to update the changes to the system, once the restore job has been completed. 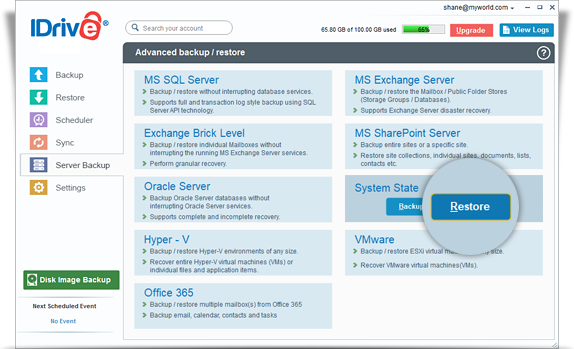 View the steps to backup system state.